Filled with a quiet, internal rage was how I moved through the world today. It looked like peacefulness to my therapist as we talked about a smorgasbord of things. I forget that I’m the only one with an accurate read on the death clock -- the internal monitoring of days and months that continue to scar my heart, as if I cut notches there to keep track of how long you’ve been gone. When I close my eyes, I see what they would look like, like a row of red toothpicks. Two-and-a-half years today. An impossible two-and-a-half years of sleeping and overeating and under-eating and drinking and driving driving kids here and there and ruminating and sobbing and longing for you. I often wonder how I’m still breathing without your exhales to kickstart my inhales. Yet, I keep breathing. I often wonder how my legs carry me from here to there without your hands reaching for me, your voice calling for me, luring me to from where I am to where you are. “Mom?” it would call out, and reflex expanded and contracted the muscles needed to get to you. I would go anywhere to hold your hands, hold your soft face, brush my cheeks against the “straight afro” you were growing. After therapy, the quiet, internal rage continued percolating in the background as I went to the Post Office and to the gas station to have my car smogged. Then I was rude to A, who wanted to talk to me while he ate his lunch. All I could think about was how he didn’t know it was two-and-a-half years since you died. He didn’t know that it was two-and-a-half years since you died while he chatted at me about work things. He didn’t know it was two-and-a-half years since you died when he told me about his plans for tonight to meet up with a friend who just went back to work after having heart surgery. He didn’t know it was two-and-a-half years since you died when he told me he wished that he was meeting up with the friend who just went back to work after having heart surgery on another night because Thursday night is Pub Night. He didn’t know, even though he knew it was Riley Day. It says so on the white board in the kitchen, as it does on the 20th of every month. It’s when we eat something for dinner that you would like, or at least eat something that includes ingredients that you like. Tonight’s dinner included some of your favorites -- garlic, basil, tomatoes, and pasta, topped with Romano cheese. I even used the Tabasco-flavored olive oil that you got for Christmas to give it a little kick. It also included lentils and onions and peppers, but I can't remember how you feel about those things. The 20th of every month is also when we are supposed to hang a flag. It’s also when we have hot chocolate. But then, because I said I didn't mind, A was leaving to meet the friend who just went back to work after having heart surgery even though it's also Pub Night, and I had to drive H & C to yoga. So there was no time to hang the flag we made when we went to Tahoe in February. Even though it's Riley Day. Even though it's the 30th Riley Day since you died. Two-and-a-half years of eternity without you. Then the house was quiet while B did his homework. And I wore my quiet, internal rage like a badge, and I was mad at A, even though I said I didn't mind when he told me about meeting the friend who just went back to work after having heart surgery. So I sat in bed and started to watch the 60 Minutes news segment about Newtown, four years after 20 first-graders and six educators were murdered. And we still don't have any sensible gun laws. I shake my head at the continued stupidity of our lawmakers who continue to let people on the government No-Fly list buy guns. Who refuse to do anything to prevent more dead children. Guns aren't the problem, they say, it's mental health. But then they cut mental health funding. I'm sure those Newtown parents are shaking their heads too, or banging them against walls. Or just hiding under blankets like I do so much of the time, realizing their children will never, ever not be dead either. I wanted to look at those grieving parents, the dark circles imprinted above their cheekbones. I wanted to see what grief has done to them, to their ability to move and talk. If it's anything like me, I can talk and move better if I'm talking about you and moving for you, as in working on a project that has to do with you. It's all for you. Mid-program, the dog started barking. And barking. And since B was doing his homework, I went to the door. It was our neighbor. She was returning some clean dishes from the dinner I brought them -- the one inspired by your food preferences and in honor of you on this anniversary -- with a half drank glass of wine. She came to sit with me. I brought her upstairs to my favorite sitting place in my bed. I didn’t know that I needed someone to sit with me; but she knew I needed someone to sit with me. And there she was. She could see the emotion on my face and I told her about the news segment about the dead children I'd been watching. “Sometimes we like to press on the bruise,” she said. And then loud, ugly sounds burst from my throat while tears streamed from my face and into my shirt. She was right. Pressing the bruise was the thing that gave access to some of the quiet, internal rage I'd been wearing as a shield all day. Pressing it a bit let me translate it into what it actual was -- heartache. It was just easier to go to the Post Office and to the gas station to get the car smogged feeling angry than it was to feel heartbroken at the eternity of the last two-and-a-half years without you. Riley with Freddie circa when the call was made. I sometimes use Riley's bedroom as a space to make private phone calls. Yesterday was one of those days. I was on the phone for 50 minutes with our health insurance company, trying to figure out why some bills are going unpaid even though we have coverage. Then I spent another 30 minutes on the phone with the doctor's office. After I hung up, I put my phone and pen on my stack of papers and walked to my bedroom where I set all of it on the bed. From there, I stopped in the bathroom, then grabbed my phone off the bed before heading to put on my boots so that I could go pick up kids from school. I set it on the table before bending down to pick up a boot. As I pulled the boot over my heel, Riley's voice came out of my phone. It was a saved voicemail. It was a call that Riley had made from my house to his dad's house when he was about nine years old. His dad had saved the message on his phone and shared with me via Dropbox not long after Riley died. And now here it was playing in my otherwise quiet house. His voice was shaky; he had called his dad to let him know that he'd forgotten Freddie at his house and asked if he would bring him over in the morning. I remember that night. His favorite item several blocks away. He'd have to settle for a lesser-loved soft toy to snuggle as he fell asleep. There were tears. And hugs to console my sad boy. But how did Riley's voice end up being played from an inactive phone? When I opened my phone to see what was happening, Dropbox wasn't even one of the active applications. I just stared at it for several minutes, bemused and delighted to hear him and also sad because he was so sad. And also sad because I'll never hear his voice shape words into new sentences or questions. He won't tell me any jokes or read me Jon Agee palindromes or describe situations in bizarre Far Side comics. There will be no puberty or deepening as his sweet boy voice transforms into a kind man voice. I won't know how that voicemail played in my living room. But I do know that I am open to believing that Riley made it happen. I will just chalk it up as another one of the unexplainable messages from him that make him feel everywhere and nowhere at the same time. Younger Brother had his first band concert last night. It was held in coordination with the orchestra concert. It took place in the auditorium that Central Middle School and the Arroyo School share. Riley went to Central. YB goes to Arroyo. And it's confusing. 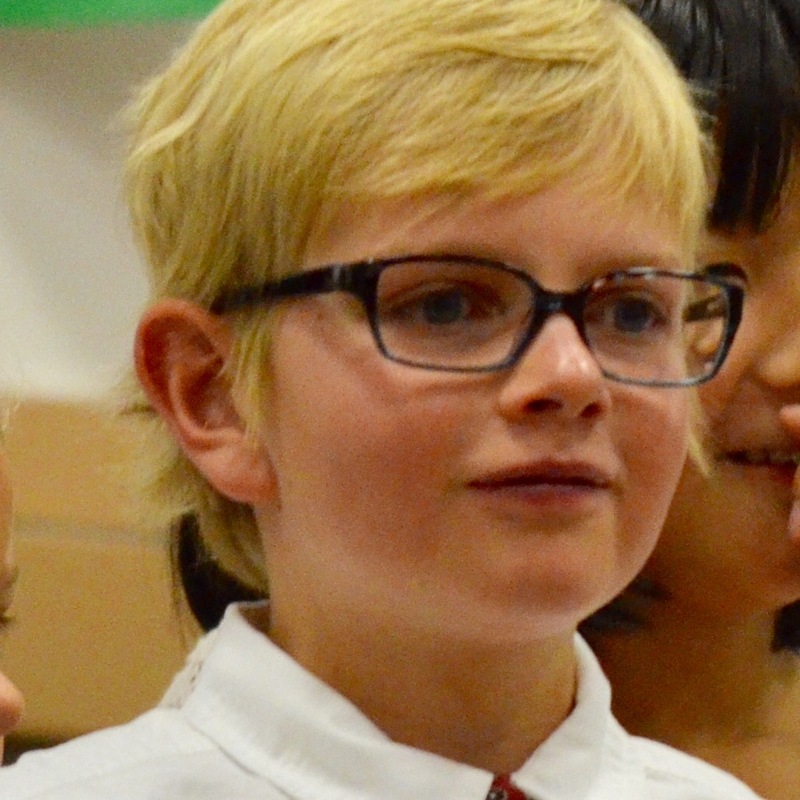 Even though Riley was a 6th grader when he died, he never got to play in an orchestra concert for 6th grade because he died in October and the first concert each school year is held in December. So the only two concerts he participated in were when he was in 5th grade. YB is in 5th grade. How can YB be playing in the band concert in 5th grade and Riley also be playing in the orchestra concert in 5th grade? The orchestra even played "Dragon Hunter," which was Riley's favorite piece of music. I looked for him among the cellos. He wasn't there. I also looked for him among the violas because he switched to viola in 6th grade. He wasn't there either. I scanned their faces, not recognizing any of his peers. That orchestra doesn't know Riley. There wasn't an empty chair for him; there weren't any green ribbons tied around anyone's arms in remembrance. I suspect if I had new memories of Riley playing in an orchestra concert in 6th, 7th, or 8th grade, it would make more sense. But I don't. So it's all mixed up, these two children performing at the same concert. Next year will be even more confusing because YB will be at Central as a 6th grader. And how can both of my boys be 6th graders at the same school? At 11:20 pm, 14 years ago, Riley was born. He lived for 11-and-a-half years. And now he will never, ever, ever, ever, ever, EVER not be dead. All day, I've been wanting to disappear. But where would I go? There is no place on this earth that would feel less miserable. There is no better place because Riley is nowhere. Yes, he's in my heart, but there is no physical place I can visit him, hug him, talk to him. I miss talking with him. How I long for the Mirror of Erised. It feels impossible to describe the hole inside of me, the massive heartache and longing for my boy who I will never get to be with again, at least in this lifetime. The forever of death is so painful and impossible. And relentless.